2011 will not be remembered as a particularly good year for the world. Between a myriad of horrifying natural disasters, the uncertain outcome of the Arab Spring, political gridlock in the U.S., the EU’s seemingly unraveling state, austerity protests, and a generally ugly economic period, the events of this year have not offered much to smile about. But for dance music fans, 2011 was a year rich with exciting music coming out of house, techno, bass music, and everywhere between and around. While it might not be remembered as the most progressive of years — retro and recently unearthed seemed to be the most popular aesthetic themes — enthusiasts will be able to look back at their 2011 finds and say with certainty that many will still be worth their weight in the years to come. 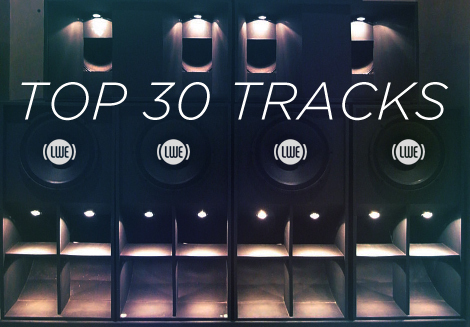 As in past years, LWE’s reviewing staff has devoted a great deal effort combing through the year’s releases to bring out our top 30 favorite tracks of 2011. Your mileage may vary and many great tracks were left out, but for us these selections defined our 2011 listening experiences. Our individual staff lists will be published this Friday. Last year, Oskar Offermann and Moomin’s “Hardmood” just sneaked into LWE’s top 25 list. “Hideaway,” actually released the same year, similarly showed the power of bold, carefully crafted percussion, favoring solid basics over audaciousness. This was a sentiment reinforced by its mostly regressive palette. The 12″ itself — the tenth on Dial’s prestigious sub-label – actually offered three nuanced versions. It was this, however –the wisely-chosen A-side – which appeared the most confident with its essentials and consequently, caused the biggest splash. I first encountered it through Oliver Hafenbauer, Live At Robert Johnson’s A&R guy. When I searched frantically for it the next morning, there was no uncertainty as to whether I’d stumbled onto the same tune. Its friendly, warbling synth program and shrugging hats were instantly recognizable. And isn’t that about the best one can hope for with a track of such modest ambition? Imagine you heard Tin Man’s “Nonneo” on Earth in 2011. (If you followed dance music this year, then this probably isn’t a difficult scenario for you to conjure.) Now imagine that, immediately upon finishing the track, you’re hustled into a spacecraft and launched toward some distant black hole. Your ship circumscribes the event horizon for awhile, where gravity is strong enough to warp time, and then you blast off back toward your home planet, thousands of years having effortlessly passed. After being extracted from your ship by fusion-powered robots, you’re transferred to a holding pen curiously outfitted with some reconstituted artifacts of 20th-century electronic music production (they got the Roland plates right and everything), and a perfectly polite but obviously synthesized voice asks if you might recreate that tune you heard moments before your adventure began. My guess is you’d produce something like Donato Dozzy’s masterful remix, wherein the power of Tin Man’s original is amplified despite so many of its sounds getting lost in the ether. Of course, having the year’s best bass line at your disposal makes losing the rest of your stems somewhere between Neptune and Uranus a rather tasty prospect. Martyn on Brainfeeder: the pairing of the L.A. beat freak (out) kings with the mature, measured, steady Dutchman certainly turned heads this year. And while the wildly experimental label was certainly not the first that many listeners would associate with a Martyn release, the results of this 12″ (and the resulting LP) were both strong and some of the most unabashed and simple 4/4 dance floor tracks Martyn has put his name to. Never mind “bass music” — this is house music: shuffling, bleepy, mildly experimental and imbued with the warmth, humanity and storytelling that Martyn has refined over the past few years. Good to see Tin Man and Dozzy in the chart, it’s one of my favourites too. That Chicago Skyway remix is immense. The B from Equalized is simply stunning. I can see it ending up on next year’s list by sheer force of will.